This entry was posted in Las Vegas, Poetry and tagged a poem, Las Vegas. Bookmark the permalink. You’ve convinced me with your clever rhymes. 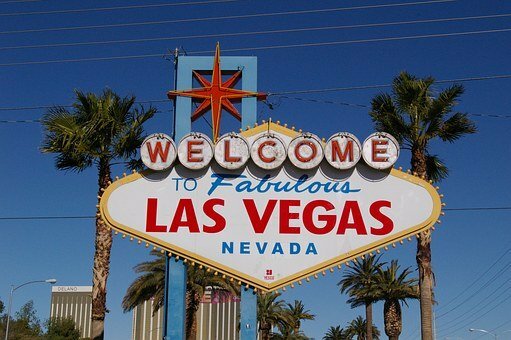 My next trip will be to Las Vegas! Four days max. It can get old fast but it’s so much fun! I don’t really gamble but the shows are great and everything is bigger than life. The neon at night is wonderful and the most important thing of all: WEAR COMFORTABLE SHOES and don’t worry how they look because Vegas is about walking. The hotels are FAR apart and when you’re in them, you’re still walking miles because they are huge. LOLOL You can tell the newbies because a lot of women bring heels and you can see the bandages and blood on their heels. Really…lots and lots of walking. It’s a stop on a lot of tours coming from Europe and that’s so much fun. People talk and can’t believe what Vegas is like. I try to tell them it’s the ONLY place like it but somehow I think they believe America is a fun house. Fortunately, they’ll be on their way to there places where they can see more of the country. The first time you’ll find out what you like. See LOVE, by the Beatles. Get tickets before you go and get good ones because if you go on cheap ticket sites you may be sitting behind a post. I always stay at the Aria now. It’s wonderful. Peaceful and the rooms are nice. It’s not quite in the middle of the Strip but it’s a great location. They remodel the hotels all the time in order to compete with the new ones. I wouldn’t stay at the Paris or the Flamingo but the Flamingo has a love garden you won’t want to miss. 🙂 If you ever do go…have a great time. Right now the temperatures are in the sixties and high fifties. You can go to the top of the Eiffel Tower but all you’ll see when you get there are roof tops. LOL It’s fun (at least for me) to just wander around. My daughter and I used to go once a year but I haven’t gone for two years. If you do go, check out the headliners, there may be someone you’d like to see playing at one of the hotels. It’s best not to wander off the strip. Safer that way. It’s really safe there. Plain clothes cops and others take good care of everyone, because no one wants any trouble, that’s for sure, and people do drink. There’s a outdoor pirate show with a huge ship, lots of stuff. We have never had a bad day of weather. It’s a dessert, after all:) Just remember there’s a lot of walking. Silly to drive because all you’ll do is sit in traffic. Soooo many places to eat. The shopping center next to the Aria is excellent but you’ll find out what you like to do, once you’re there. It’s always dangerous to tell someone how great a place is, since they may have different tastes, but as long as you only go for three or four days, it’s a lot of fun. Just sitting among the flowers is nice and the hotels are incredible. You can take a gondola ride too, inside and out. LOLOL New York New York used to be fun but they took a lot of the good stuff away so we stopped staying there. Having said that, you should go inside because there are tenements and steam comes up through the grates in the floor just like on the streets. So it’s cute. You can take the elevator to the second floor and cross to the MGM as well. There’s also a great pizza place there, but it’s quick and you just take a tray, so not fine dining. I think we’ve seen almost all of the shows except for Michael Jackson and Elvis. Anyway, I’m happy for you, if you go. How fabulous. My daughter just said someone who works where she does can’t get home because we are snowed in. She said, “Mom, I just heard the sweets words.” I asked her what they were and she said, “Stranded in Vegas, can’t get back.” Hahahahahaha Be sure and check out the pictures under Las Vegas, on my blog. You can see what I’m talking about. Some of them are older, since I was going every year but they’ll give you an idea. You hit the nail on the head with this one! I haven’t been there since Bill was alive. We went several times. My favorite thing to do – go running at sunrise – along the strip. There is something so peaceful about it – obviously not many people – only hotel employees hosing down the sidewalks. Sight bit of traffic, if any. The sun starts rising over the mountains in the distance – against the huge marquis signs. I love it! Oh, the perfect time…when it’s just waking up and it’s quiet and empty. I know exactly what you mean. It’s such a great place to play. Amazing post and lovely pictures .! !